The "Lao-Tzu of Ina Valley" celebrated his 90th birthday in January 2013! His birthday party and recent book "Ukeireru" (Acceptance) were featured on NHK's Good Morning Japan on January 21, 2013. You can check out a clip on Youtube at http://youtu.be/hpUn4TkICdY (in Japanese). On behalf of all who have been touched by Kajima Shozo's life and work, we congratulate him on a rich and productive nine decades and hope he will continue to share his insights for many more years to come. Born into a well-to-do merchant family in Tokyo in 1923, Kajima Shozo attended Waseda University and did his graduate studies at Clairmont College in California as a Fulbright scholar. He began his career teaching English in colleges and universities and, over a period of thirty years, translated many great nineteenth- and twentieth-century novels and poems into Japanese, including five major works of William Faulkner and works by Mark Twain, W.B. Yeats, Edgar Allen Poe, and Agatha Christy. In his youth, Kajima was dedicated to introducing the spirit of the West, particularly America, to Japan. It was not until his sixties that he turned to his Eastern heritage as a source of creative and spiritual inspiration. Over time, his art and poetry came to express the Taoist sensibilities of balance and harmony with nature. Kajima became acquainted with Lao-Tzu not through the original Chinese texts on which earlier Japanese translations had been based, but rather through English versions by Arthur Waley, Lin Yuton, and others. Translating from the English, Kajima was able to create flowing renditions in contemporary Japanese. Their accessibility, along with the beauty of Kajima's poetry, has made his translations Tao Here & Now and Tao-Lao-Tzu long-time sellers in Japan. In the best-selling Motomenai, Kajima reflects on desire and contentment in a direct and compassionate voice of experience that struck a chord with many in Japan. A follow-up volume, Ukeireru (Acceptance), came out in 2012. Kajima considers these books to be his life-work. Kajima Shozo began to study calligraphy relatively late in life. He works in the medium of sumi ink (bokusai-ga paintings) and creates paintings as well as scrolls and gasatsu (a type of artist book). Kajima paints landscapes or still-life scenes that include calligraphy poems which can be original compositions, direct quotations, or his own interpretations of Taoist poems in Japanese or English. Today, Kajima lives at the foot of the Japanese Alps in Nagano, where he finds inspiration in the change of seasons and in the spectacular mountain views from the windows of his home-studio. He lectures frequently, has held numerous solo exhibitions of his artwork in Tokyo, Kyoto and Yokohama, and has been the subject of documentaries and TV programs. An NHK documentary is in production and scheduled to air in fall 2013. Taoist Kajima Shozo and former Soto Zen leader Itabashi Koushu discuss the intersection of Tao and Buddhist spirituality. What is this mysterious Life that transcends the mind? In their talk, Kajima and Itabashi describe how we can return to gentleness and tolerance, to a slower pace of life and a suppleness that brings resilience. "Alone but not lonely". 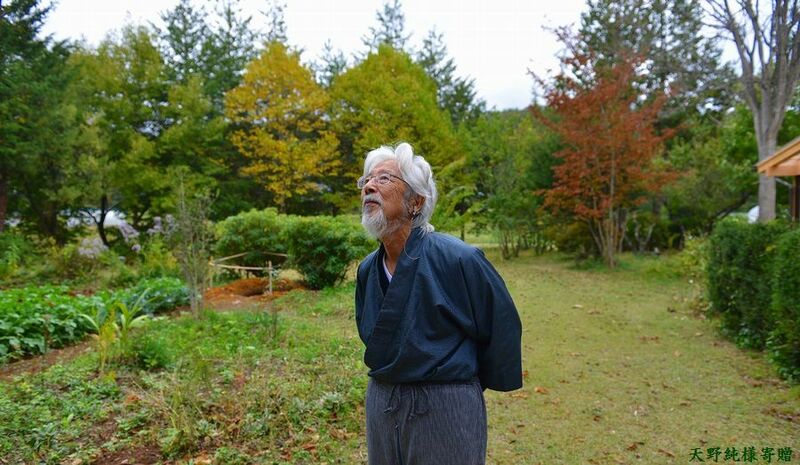 89-year old Kajima Shozo has discovered how to be alone and yet fully alive. Through photos and essays, we follow him through the four seasons in the Ina valley and partake in his daily ritual of hitori-cha, tea for one. Poetry published in magazine Doujidai "Our Age"
Yasashisa to yawarakasa to-Roshi no kotoba "Kindness and Gentleness-Words of Lao-Tzu"